nearly, so nearly an excellent rhythm (a bit jaunty for me, like) with some top singers doing their stuff, presented here as a mini-mix. a version by luciano was also in the box, but isn't included here- we certainly don't need to hear any more less than top drawer songs from him now, do we? 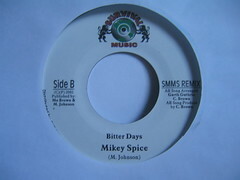 the interesting thing about these 7"s is that rather than having dubs on the b-side, they have atrocious bashment remixes, which sound wrong at both 45 and 33.
frankly, they should have concentrated on creating one storming, rootical production- mikel rose and mikey spice deserve better. earlier this year dub vendor were doing a stock clearance, and offering a box of 500 random JA and UK 7"s from the past 10 years very cheap. this is going to be an attempted to use them constructively- to give a sense of the variety of productions on offer and possibly an insight into the jamaican record industry, and the vast amount of music it creates. 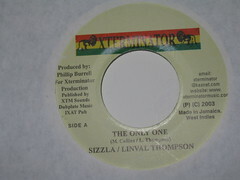 if nothing else, it will show how poor the average reggae 7" pressing is. disclaimer: the mp3s will be low quality and often cut short (as in the above case), so if you do like a song, go and buy it seen?